Secret Seclusion is the seventh and final world of Donkey Kong Country: Tropical Freeze. It is a hidden world located in the sky, unlocked after collecting all seven relics from the six temple levels, and after defeating Lord Fredrik and beating the game. It is also the smallest world in the game, consisting only of three levels, and has no boss. Similar to the Golden Temple from Donkey Kong Country Returns, the levels in Secret Seclusion have no checkpoints, and were designed to be significantly more challenging than previous levels. 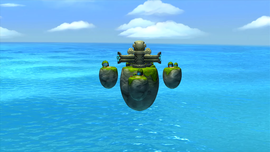 The overworld consists of three small floating isles representing the three levels, around a larger island with a monkey statue holding the two halves of the completed relic. The levels themselves are set in an ancient pantheon above the clouds, decorated with golden fish statues and filled with treasure, similarly to the bonus areas of the game. After the player clears the first secret level, Levitation Station, the statue will turn around to face the camera as the final two levels, Rocket Rails and Crazy Clouds, are unlocked. After the player clears all three levels of Secret Seclusion, the monkey statue will connect the two halves of the relic, and Hard Mode is unlocked. The music that plays throughout each level is an arrangement of the title theme from Donkey Kong Jr.
World 7-1 Levitation Station A level featuring blocks that assemble into levitating platforms. Between sections of these, the Kongs have to career through series of rising spike-covered blocks, among a few other obstacles. World 7-2 Rocket Rails A level that is mostly centered on the Mine Cart and Rocket Barrel, and the last stage to feature either of them. World 7-3 Crazy Clouds A course filled with flying plane remnants and cloudy gusts, which are ephemeral and must be quickly traversed before they disband.